In this lab. students will learn about various types of waves, and then use two types of springs to observe characteristics of waves and wave motion, including pulses, interference, amplitude, transverse waves, standing waves, surface waves and more. This lab activity employs Framework Science Standard (PS4). This kit has been aligned with all published National Standards. Pre- and Post-laboratory assessments and vocabulary words all target specific Science and Engineering Practices and common core standards. The teacher guide also contains specific "Did You Know" concepts that link the real world with the scientific standards explored. A student copymaster is also included. This lab activity can be performed repeatedly with the materials provided in this kit. 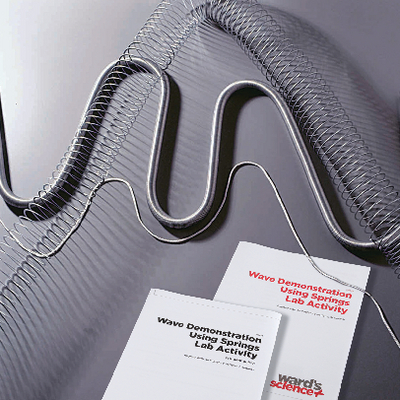 Ordering information: Activity includes 1 Wave demonstrations spring, 1 Slinky spring, 10 foot braided nylon rope, and Teacher's Guide and Student Guide. Optional materials not included are a stopwatch and fishing line. This lab activity can be preformed in one 45 minute class period.